Quality can run, but it can never hide. The story of British AOR veterans After Hours is pretty unusual, however, in these days of reformations and reissues it should come as no surprise either. We have seen bands such as Treat, Uriah Heep, Asia and many more re-emerge after years of radio silence. Established in 1987 in the UK, After Hours quickly gained momentum with their 1989 debut Take Off. A second selftitled record saw the light of day in 1992, only having to see three members of the band leave prior to this release. The record did finish, but never quite got the same succes as the debut and after that the band dismantled. When AOR Heaven reissued Take Off, I was pretty impressed (read my review on this site) and was looking forward to this newborn. The prevailing question is what more than 20 years have done with a band that non existed for all those years? Well, quality wise nothing. Against The Grain is yet another great album that makes you wonder what these boys have been doing in the years passed by. Altough the album is overall less moody and pompy than it's two decades older predecessor, it sounds surprisingly similar in terms of atmosphere. Bordering towards classic- or even blues rock and with a pleasant acoustic touch, it works very well with the roughed up voice of Francis. What also is still apparent is the beautiful interplay between singer John Francis and guitarist Tim Payne. Eleven new tracks are on offer and a highly convincing mix it has become. The album opens with Stand Up, a great up tempo rocker that sets the pace for the rest of the album. Other highlights are the fantastic AOR styled tracks Turn On Your Radio, Angel and Let It Go. When You Are Around and I Need Your Love take care of the ballads. The classic rock touch is most apparent on Against The Grain, Eleventh Hour, Hold On and I Want Yesterday. The albums closes with the acoustic version of Eleventh Hour. For all Journey fans who find their latest release Eclipse too heavy and too non-Journey, here is your chance to rebel. Against The Grain may sound just the way many Journey fans would have anticipated Eclipse but were wrongfooted. We can only hope Mr. Francis and friends do not wait another 20 years for a follow up. On the other hand, it was worth the wait. 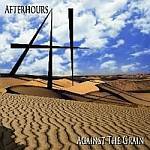 For all Journey fans who find their latest release Eclipse too heavy and too non-Journey, here is your chance to rebel: enjoy After Hour's Against The Grain instead.